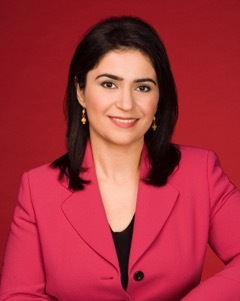 Parisa Khosravi, an award-winning international journalist, will be the featured speaker at The College of Saint Rose 95th commencement ceremony on May 12 at the Times Union Center. Khosravi served as senior vice president for international news gathering, national news gathering, and global relations for CNN Worldwide, directing coverage of countless historic news stories, including the Rwandan genocide, earthquake in Haiti, and Arab Spring. She received the Edward R. Murrow Award, Peabody Award, and Emmy Award. 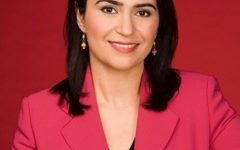 After leaving CNN in 2015, she became founder and president of Payam Global Strategies, a public speaking and consulting firm. In addition to her professional pursuits, Khosravi is the proud mother of a son who has autism. She devotes much of her time and energy to addressing issues surrounding youth with autism and has been particularly focused on finding alternative ways for those on the spectrum to communicate and interact with the world. Her powerful TEDx Talk on the subject of “silent champions” can be found here. Her son will accompany her to Saint Rose for the commencement ceremony. Khosravi, whose family immigrated with her to the United States from Iran in 1979, visited Saint Rose in 2015 to speak at the ribbon-cutting ceremony for the Center for International Programs. In addition to the ceremony, she talked with communications students about journalism during her visit. Today, she is a member of the International Programs Leadership Council, a group of friends and alumni of Saint Rose who help guide the institution on its path to global connectedness, one of the goals in the College’s strategic plan. The commencement ceremony will begin at 10 a.m. at the Times Union Center, 51 S. Pearl St., Albany.